Sketchontes are inherently about letting, borders, arrows, visual concepts, and other adornments. I’ve seen many well-drawn and formatted sketchnotes that did not have a single character. So why am I dedicating a weekly post to just characters and locations? Because this is my favorite part of Sketchnoting…the doodling part! The part where I can bring my notes to life with a character(s) who can help tell the story of my notes. Everyone has their own style so if you’re new to sketchnoting, you too will develop your own style, too. This post along with this series is to show and demonstrate all the pieces and parts that can go into a sketchnote…not necessarily have to. Just a few simple techniques to add to your awesome sketchnoting arsenal. With that, get your pens ready! Let’s define what I mean by characters and locations in the context of sketchnotes, first. Characters add visual appeal that may help pull notes into that emotional context where mood and tone are needed to emphasize a point. Locations are simply what the name implies – a place. A place to help frame the context of the notes or story. 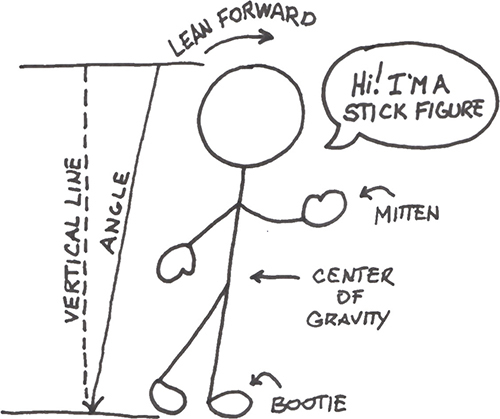 In their simplest form a stick figure is in fact a character. It really doesn’t have to be anything more than that. It’s what you do with your stick figure that makes all the difference. 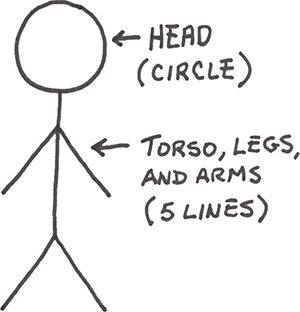 I’m going to digress a bit into my other teachings on visual communication and touch on my theory that ‘every object is first a shape.’ A stick figure (object) is fundamentally structured with basic shapes – a circle for the head and five lines (sticks) for the torso, legs, and arms. BAM! You have a character! 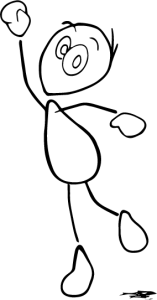 Consider the stick figure above and then look at the stick figure below with a few extra shapes added to represent hands in the form of mittens and a couple more shapes to represent the feet. Those extra shapes coupled with adjusting the center of gravity your stick figure just came to life! By adjusting, moving, and positioning the sticks of your figure, he/she can help your notes tell a story. Just like any language, visual communication is a language with a set of building blocks. We started with a stick figure and then added mittens and booties. Next we’re going to add a few subtle lines that will completely distinguish a male from a female. 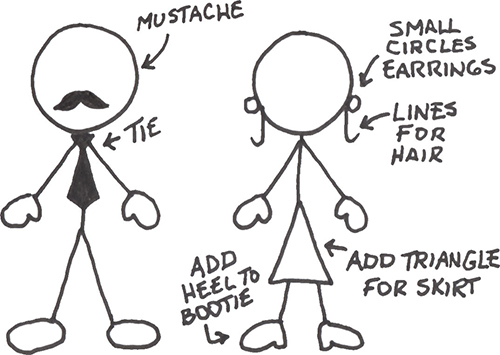 For the male figure add a tie and a mustache. For the female add all or a combination of lines for longer hair, earrings, a triangle for a skirt/dress, and indent the bootie to look like a heel. And please don’t get on the stereotype bandwagon that girls sometimes wear ties, and guys have long hair and wear earrings. Got it. This technique is to simply show how to distinguish the two genders while Sketchnoting characters on the fly. Dress your characters anyway you choose. After this sketchnote series I may do an entire separate series on characters for expressions, emotion, accessories, gestures, age, gender, race, etc. For now, let’s focus on getting you comfortable with adding simple characters to your sketchnotes. After some practice and a few more techniques I will help you build your skills to put some pizazz and life into your characters! As you practice and progress, try changing the shape of your character with a teardrop, square, or star shape for the torso. I will cover this in more depth in a future post as well. 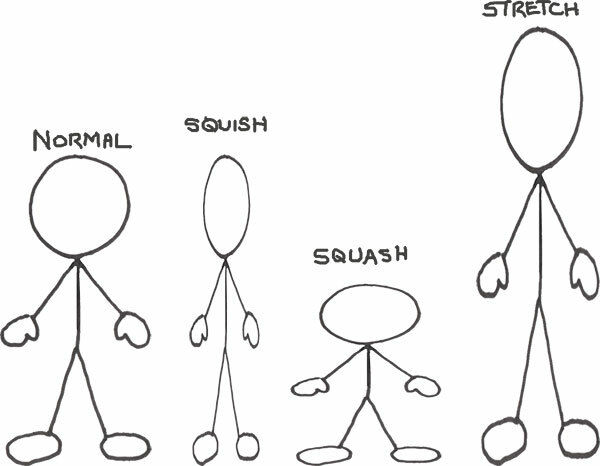 Squash, Squish, and Stretch is an animation industry phrase that refers to changing a shape’s normal condition. 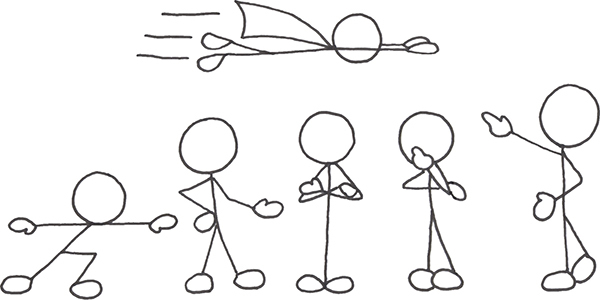 Changing a shape – in this case a stick figure – one can completely change the attitude and tone of the character. 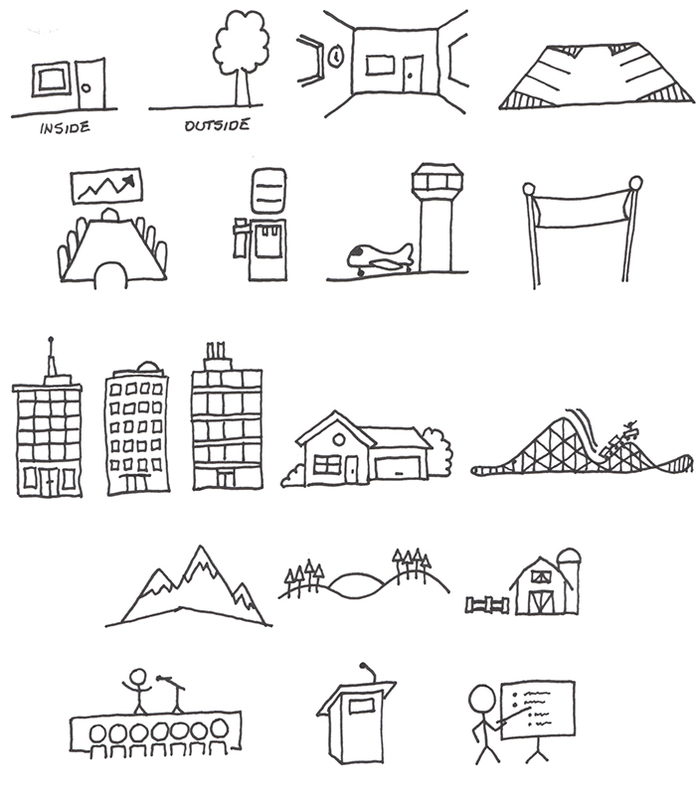 Location in the context of Sketchnotes is not about the location of the event or talk you are sketching, rather visually sketching concepts to depict a particular location or a place. Some locations are more conceptual such as a board meeting or the watercooler while others are simple nouns like a parking lot or an airport. Location concepts or objects may help tell the story you are sketching. Are they a must or required? No. No more than characters are required. Sometimes a simple sketch of a location will totally tie in with the sketchnote. Below are several examples of simple lines and shapes that communicate a location. Can you tell which are which? Study the center drawing between the mountains and the farm. Simple. A curvy line for two hills and a valley. An arc for either a distant hill or a large setting sun. Eight sticks with little triangles representing a forest. BAM! Five seconds later you have the “Sun Valley” location. Think of these new skills on sketching Characters and Locations as tools similar to that utensil drawer in your kitchen. You know the one. It’s full of kitchen gadgets that only do one thing. Yet, when the time is needed you reach into your ‘toolkit’ and pull out that apple core removal tool. You guessed it. Characters and locations. Work on your stick figure this next week. The next meeting you have to attend at work and realize you are about to lose an hour or two of your life you will never get back is the perfect time to practice! Practice drawing stick figures with mittens and booties, and in different poses. Practice drawing your stick figure 500 times. Only then will your own style begin to surface to the point all you have to do is think about your stick figure character and it will fall out of your pen on its own! Next, practice adding accessories to give your stick figure characters personality. Hair, hats, beards, purses, jewelry, and maybe even holding a coffee cup, clipboard, or tablet. Keep in mind you are also practicing the ability to quickly communicate visually as if you were sitting in a live talk at an event. The fewest of lines and shapes are your goal. One way to practice is to list out ten locations and hand it to a friend, spouse or colleague. Have them randomly say a place on your list and time yourself with a limit of 10-15 seconds. Once finished, ask them if they can identify your sketches and line them up with the list. No lettering or labels as that’d be cheating! STEP 1 – Preparing: Live sketching or Post-sketching?